Eric Harley’s radio career spans over three decades. He has entertained listeners across America with his insight and humor. During the height of the Alternative Format boom of the 90’s, Eric handled creative services for 94.5 The Edge (KDGE) in Dallas. In 1996, he gained national exposure as host on the Pure Gold Oldies format for ABC Radio Networks. In 1996, Eric came aboard to co-host The Midnight Radio Network as the show launched nationally.Growing up as the son of a military veteran (Eric’s father served in two foreign wars), Eric has a deep affection for those who serve. As a dedicated runner, he loves to clear his mind on the road each morning. More importantly, he is a dedicated husband and father, who enjoys nothing more than spending time with his family. Gary McNamara launched his radio career at WJJL Niagara Falls, NY. From there he returned to his hometown of Buffalo, where he broadcast from WBEN. Following successful stints with WLS in Chicago and KXL in Portland, OR, Gary joined the roster at Dallas/Fort Worth’s WBAP in 2000. He served as an afternoon drive personality for the station before being paired with Eric Harley in 2005 to co-host The Midnight Radio Network, which had built a loyal following among late night radio listeners. 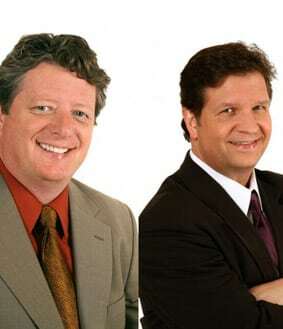 In 2012, Eric and Gary became the hosts of Red Eye Radio, which airs on more than 200 affiliates.Prior to entering the broadcasting world, Gary compiled a resume as colorful as his personality. From janitor to bill collector to assembly line machinist and stand-up comic, Gary’s “regular guy” persona make him one of the country’s most relatable hosts.When he’s not on the air, Gary enjoys being on the golf course or playing a game of pick-up basketball with his neighbors.